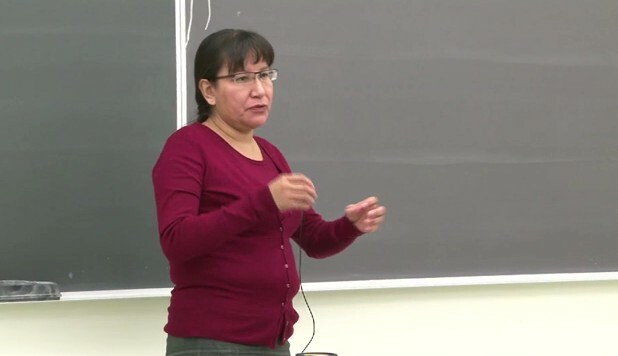 Sylvia McAdam, an author and educator from the Nehiyaw (Cree) nation, talks to class room full of Indigenous young people at the First Nations University in Regina about Cree law and the human birth. Sylvia McAdam was born and raised on the Big River Reserve in Treaty Six Territory. She holds two degrees, in law and human justice; and currently teaches at the First Nations University. She is also the author of the 2009 book, “Cultural Teachings: First Nations Protocols & Methodologies” which provides a guide to appropriate traditional etiquette for individuals attending ceremonial activities of Indigenous peoples in Saskatchewan.